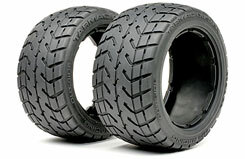 All Products > "4840 HPI Racing Tarmac Buster Tyre M Compound"
Get ready for the tarmac terror! Equip your Baja 5B buggy with front and rear Tarmac Buster tyres for running on any paved surface! With great racing looks and a smooth, 'shaved' appearance, the Tarmac Busters not only look amazing on the Baja, they provide amazing performace as well! Be the envy of your racing buddies with the Baja Tarmac Busters! Note: inner foams are not included, Baja owners can re-use the #4812 moulded inner foams from previous sets of tyres, as these are very durable foams.